Citizens earnestly wait and watch the live ballot counting in front of the office of the opposition party. Photo by Irrawaddy shared on Facebook. Despite some reported irregularities, Myanmar succeeded in holding a peaceful general election on November 8. A total of 91 political and ethnic parties participated in the election. The current ruling party, Union Solidarity and Development Party (USDP), is led by the President Thein Sein; while the opposition party, National League for Democracy (NLD), is headed by Nobel Peace Laureate Aung San Suu Kyi. Regardless of the election results, 25 percent of the seats in Parliament are reserved for the military. This is based on the 2008 constitution drafted by the army to ensure that it continues to wield influence in the civilian government. Furthermore, Aung San Suu Kyi is constitutionally barred from becoming president even if her party wins majority of the votes because she was married to a foreigner and she has foreign children. Although it is technically Myanmar's second general election, many consider the November 8 event as the country's first free and fair election. Myanmar was under a military's dictatorship for 50 years. In the 1990 election, Aung San Suu Kyi's party won with a landslide victory but the military ignored the results and took control of the government. In 2010, the government allowed some political reforms like the holding of election although it was accused of rigging the results. Some of the issues that marred the pre-election campaigning include the reported massive errors in the voters’ list, disenfranchisement of some ethnic groups like the Muslim-dominated Rohingya, and the perceived biases or flaws of the election commission. Despite these challenges, many citizens continued to believe in the promise of the November 8 election to promote change in society. Many people used slogans such as အသဲကြားက မဲတပြား (A Ballot From Our Heart) and ပြောင်းလဲချိန်တန်ပြီ (Time to Change) which reflected the popular sentiment about the general election. Below are some of the observations shared by voters during election day on various social media platforms. Some people lined up as early as 4 a.m. even though polling stations didn't open until 6 a.m.
Ye Ling Aung tweeted a photo of people queuing to vote. My Burmese friends who have voted are proudly sharing photos of their ink-stained fingers — proof of casting a vote. You might say, today the Burmese people give the old regime the finger! Activist Khin Ohmar noted that many people complained about not finding their names on the voters’ list, while some people testified about receiving multiple voter approval cards. She also read some news that the ruling party is leading in the army constituencies. Respect those who are on duty at the polling station. Some of them have not even eaten the whole day. Salute their patience working for change. 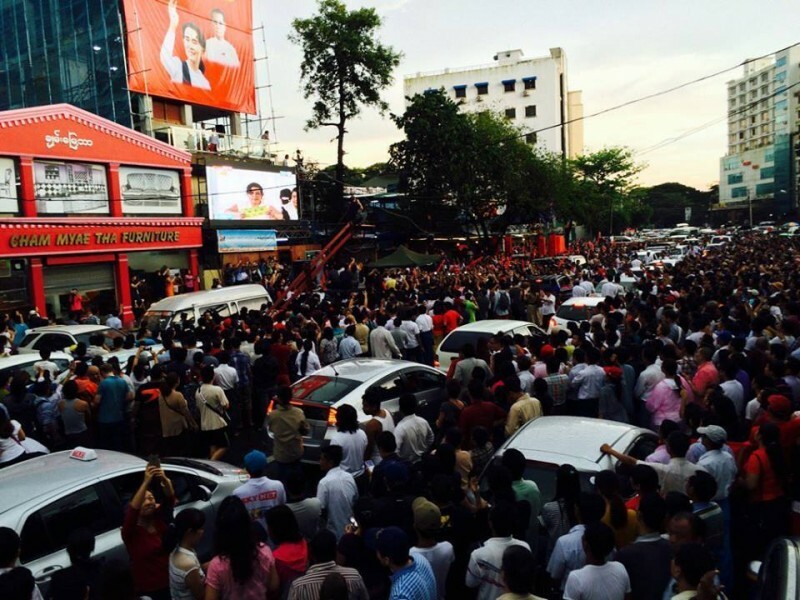 A crowd gathers in front of the NLD office in Mandalay to watch the live counting of ballots. Photo shared by Nik Nayman on Facebook.